RVC 2019 Hosts, Destination Ontario and Tourism Toronto, in cooperation with Union Pearson Express, are delighted to provide all Rendez-vous Canada delegates COMPLIMENTARY round-trip travel to / from Toronto International Airport (YYZ) on UP Express. See Airport Transfers section below for more information. Complimentary shuttles will be provided to / from select official RVC Hotels, the Metro Toronto Convention Centre and select official RVC hospitality events. Schedules will be posted and printed copies available at all RVC Hotel information desks. See Shuttles section below for complete shuttle schedules and more information. 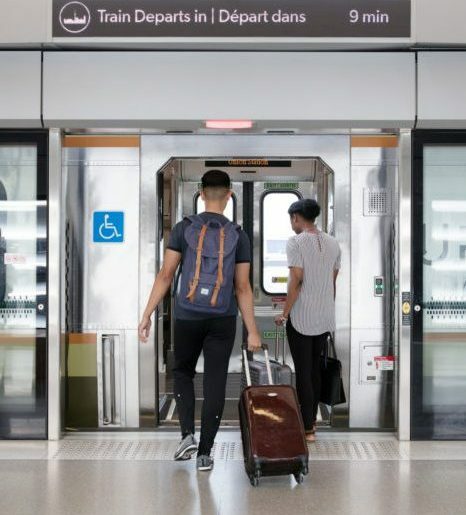 UP Express connects Canada’s two busiest transportation hubs: Toronto Pearson International Airport and Union Station in downtown Toronto. UP trains depart every 15 minutes, and the journey takes just 25 minutes. The first train departs Pearson Station (airport) at 05:27 and last train at 00:57. The first train departs Union Station (downtown) at 04:55 and last train at 01:00. UP Express is more than just the promise of a fast 25 minute ride. Travellers are at the centre of everything UP does—from free Wi-Fi on trains and in stations courtesy of CIBC Bank, personal outlets to charge devices and up-to the-minute flight information. To take advantage of complimentary travel on UP Express, please be prepared to show proof of your registration for Rendez-vous Canada. Simply board the UP Express train and present your registration confirmation email (printed or digital) or printed voucher when the Guest Services Representative conducts fare inspection. Vouchers will be emailed to all registered delegates on May 22, 2019. Proof of registration represents a round-trip on the UP Express during RVC; this exclusive offer is valid between May 22 and June 6, 2019. For more information on UP Express, visit the Toronto Pearson International Airport website. PLEASE NOTE: Delegates are responsible for their own ground transportation and associated costs between the Union Station and hotel. Uber is making it easier for riders to connect to and from UP Express. This collaboration aims to expand the reach of transit in our city. Follow the Uber signs or check your app for instructions—you’ll find your driver in no time. Your driver will meet you on Station Street, down one floor from the UP Express station. Airport licensed taxis and limos offer fair, flat rates to your destination and meet specific safety requirements. These are the only vehicles authorized to pick up fares from Toronto Pearson. Taxi fare average $50-$60 to downtown depending on traffic conditions. Limousines charge a flat of $56 to $69 depending on which zone. For more information on taxi and Limousines, visit the Toronto Pearson International Airport website. Toronto is a very walkable city. PATH – Toronto’s Downtown Pedestrian Walkway spans more than 30 kilometres. The Fairmont Royal York, Strathcona, InterContinental Toronto Centre and Toronto Marriott City Centre Hotel are located within an easy walk of the convention centre. Complimentary shuttles will be provided to / from select official RVC Hotels, the MTCC and select official RVC hospitality events on the following days. Schedules will be posted and printed copies available at all RVC Hotel information desks. Shuttles run every 15-20 minutes. Frequency of service subject to change pending traffic congestion caused by on-going construction projects throughout the city. Information subject to change at any time without notice; please refer to the sign in the hotel lobby and on-site shuttle flyer for most current information. Service from the Toronto Event Centre to RVC Hotels from 9:30-10:30 pm, every 10-15 minutes. Copyright 2019 Rendez-vous Canada. All Rights Reserved.